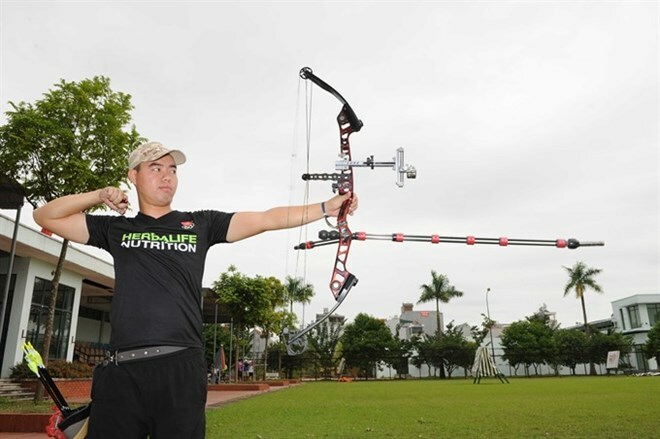 Hanoi (VNA) – Nguyen Tien Cuong and Loc Thi Dao are expected to win gold medals in the men’s individual three-string bow and the women’s individual one-string bow events respectively at the 29th Southeast Asian (SEA) Games in Malaysia. The Vietnamese archery team arrived in Malaysia from August 13 with 16 athletes to vie for 10 sets of medals. They start competing on August 16. Cuong is considered the most experienced member of the archery team, having 14 years of training and competition under his belt. He is world No 72 and is the highest ranked archer in Southeast Asia. He marked a milestone for Vietnamese archery by winning the first individual gold medal for the country at the 27th SEA Games held in Myanmar in 2013. Two years later at the 28th SEA Games in Singapore, he came home with gold again. Besides Cuong, Loc Thi Dao is also a golden hope for Vietnam. She has won a gold medal in the women’s one-string bow event at the 2017 Asian Archery Cup in Bangkok, Thailand, in March. Coach Cap Manh Tan said with confidence that the Vietnamese archers would overcome their main rivals from Thailand, the Philippines and the host Malaysia. Vietnam will send more than 470 athletes to compete at the Games in Malaysia from August 19-31. They are scheduled to take part in 32 out of 38 sports and meet about 6,000 athletes from 10 other countries in the region.